Ebay Diwali Special Flash Sale Loot on Pendrive, Pendrive Sale is Back Again, Ebay Online Loot Diwali Deal Offer, Toshiba Hayabusa Pendrive Trick Coupon – Buy Toshiba Hayabusa 16 GB Pen Drive at Just Rs.179 Only…. Ebay is back with another Diwali Flash Sale loot deal offer for all users. Ebay present 16GB Pen Drive at Rs.99 Sale offer in this festival season. They gave lots of chance to buy 16GB Pendrive at Rs.99 only. Now once again amazing offer for those who missed this deal. Now you can buy Toshiba Hayabusa 16 GB Pen Drive at Just Rs.179 only. This is still one of the best loot deal offer on Pendrive. This offer is only valid for the new users. This is the last time to buy 16GB Pendrive at Rs.179 only. 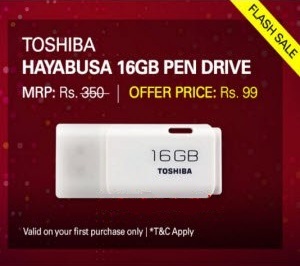 So if you missed this deal then just grab this amazing loot deal & buy Toshiba Hayabusa 16 GB Pen Drive at Rs.179 only. Sign up a new Ebay account using New Email & Mobile Number. Enter Coupon code – 179TOSHIBA and click on Apply. Finally you will get Toshiba 16GB Pendrive in just Rs.179.